Once wrote an essay titled "Chivalry isn't dead"
It was so brilliant my teacher read it aloud and then handed it to me. It was another incident to render me dateless for many months. 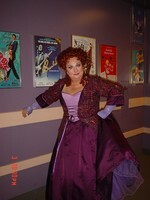 Judith Schwenzfeier Glenn (Christin stage name) has a birthday today.